Hey Ladies, I have a fun giveaway for your man for this Valentine’s Day. Gillette has generously donated a prize pack to one lucky Mommies with Style winner. 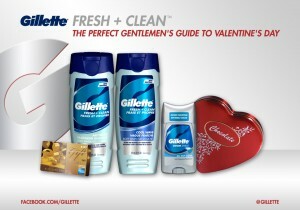 Gillette also shares some expert advice in grooming and fashion, shopping and gifting, and date secrets for men. One small thing can ruin the night, but this guide will fully prepare men for the romantic evening every girl wants. By recommending something as simple as using Gillette’s Fresh + Clean Body Wash for that just-out-of-the-shower freshness that lasts, Gillette will help any guy—from your boyfriend to brother—become a “perfect gentleman.”To enter, comment below. This will be a quick one since Valentine’s Day is Monday so enter by end of day Sunday, February 13th. I’ll notify one winner on Valentine’s Day (2-14) and you can tell your hubby or guy that you won! Comment below, what do you think your man would use the $100 gift card for if he were to win? Extra entries by 1) Tweeting: Follow and @mommieswstyle so I know you did it. Leave a comment letting me know you did it. 2) Like Mommies with Style on Facebook, leave a comment letting me know you did it! He’d probably put it towards a better TV or a super duper remote control! He’d go clothes shopping. He hasn’t been able to in a long time, due to bills. My husband would probably get something for my daughter. We have quite a few home repairs so I have a feeling he would use it towards that. Hmm, I’m hoping he’d use it to buy me earrings. He might use it for golf balls, though. My husband would probably love a new pair of shoes. I’m sure he could find something to buy with it!! Thanks. Since I don’t have a man to give it to, I will use it for a massage. He would probably head to Best Buy and buy some movies or cd’s. I don’t have a man. I’m single. He would use it towards Kindle books. I Like Mommies with Style on Facebook. I would hope it’d be on a nice dinner and show. My man would use it on clothes. He’d buy some guitar gadget. He would use it to get some new clothes for job hunting. My husband would take me out to dinner and a movie. It’s been a long time that we have been able to go out.